WARSAW – Taylor Mills could be the Poster Boy for Perseverance. 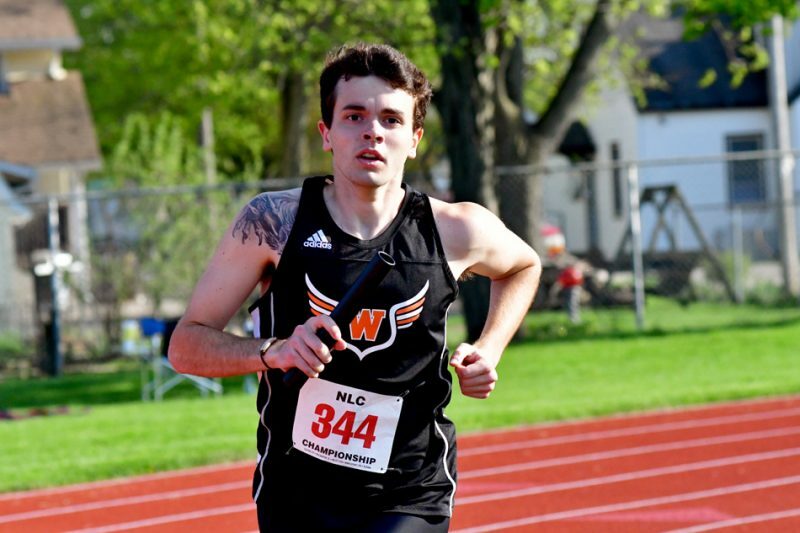 The WCHS senior has ridden a roller coaster of ups and downs throughout his high school athletic career as a distance runner. Mills though come Saturday will be rewarded for his strength as he takes part in the IHSAA Boys’ Track State Finals at Indiana University. Mills, who has stuck with his running career despite injury and adversity, is looking forward to one final run as a Tiger. He will compete Saturday in Bloomington as part of Warsaw’s 4 X 800 relay team. Mills will team with senior Xavi Ramirez, junior Nolan Groninger and freshman Tanner Stiver for one last prep race. The foursome earned a State Finals berth by placing third in the Warsaw Regional last week in a time of 8:02.94. The team was second at the Goshen Sectional the previous week in a time of 8:08.56. Mills has been put to the test with plenty of trials and tribulations throughout his cross county and track careers at WCHS. He had a stress fracture that ended his sophomore cross county campaign. He then had to deal with the emotions of having an off day as the semistate meet in 2016 as a junior when his team finished in eighth place to miss qualifying for the State Finals. The top six teams from the semistate advance to the State Finals. Mills admits that it’s not been an easy journey. “After my junior cross country year, I almost quit,” said Mills. “I knew that it was on me that year that we did not make it to State. I ran my worst race of the season at the semistate. Mills, whose father Jim is the longtime highly-sucessful WCHS boys cross country coach and a running guru, pushed through. Mills has proven that his decision was the right one. The talented young man received a prestigious Pete Thorn Award last week for lettering in three spots. He also earned a letter as a very valued member of the statistician team for the Warsaw boys basketball program. Jim Mills knows that his son has proven his toughness. “Taylor has shown perseverance to not get down on himself and to push through things, whether physical or mental,” said the elder Mills. “It would have been easy many times to quit, but he has rose above things. I just feel good that he’s shown a lot of mental toughness. I’d like to think that he picked up a little of that from me. Mills has also been an important part too of many successes in his prep running career. He helped both the cross country and track programs claim NLC, sectional and regional championships the past four years under the direction of his father and track coach Matt Thacker. Jim Mills will be one proud man come Saturday at the State Finals. Mills, who plans to run at the University of Southern Indiana next season, also has something to remind him of his journey. Prior to his senior cross country season last fall he had gotten a tattoo on his right chest and shoulder area of a dragon. “It means a lot to me,” said Mills of his tattoo. “It reminds me of the mentality that I had to have working through my issues. You have to be fierce and aggressive and not back down and charge ahead. Things are definitely looking up for the young man with the face of perseverance.